WYSIWYG (pronounced wyziwyg), is an acronym for What You See Is What You Get. WYSIWYG is a very close expression to say that we designed this important Arabic language acquisition program and all of its features with non-Arabic speaking students in mind. We put the suggestions of world language teachers and educators in the scale, and we put six years for this special development because we understand how serious it is to learn and to speak a second language like a pro. The original idea behind this major work was initiated to help our students learn and use Arabic as a useful tool for communication with others while visiting or working in an Arab country, or just to support his/her studies or research at a public library or working at home. eArabic Pro 6.0 software program consists of 51 windows. 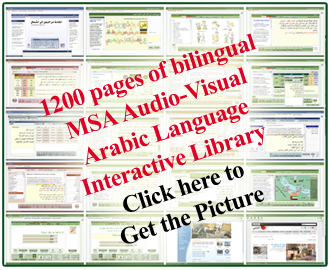 Each window features a rich, interactive, audio-visual library of information related to the particular requested field of Arabic language study. You may use eArabic Pro 6.0 to start learning Arabic as a novice, or use it to master the Arabic language in less than one year. 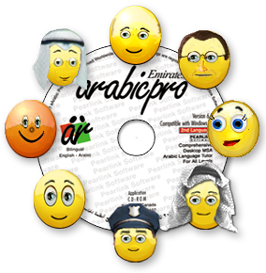 eArabic Pro is user-most-friendly Arabic language acquisition software program, and yet, it offers a proven successful methodology of teaching Arabic to non-Arabic speaking natives at home, as though they are learning it at school in an Arab country. Learn Arabic with eArabic Pro 6.0 to speak, read and write in Arabic with ease and with the confidence of an educated native. Be a pro. All the exercises are ready to be read for you. Just pay attention, repeat and learn. The program will tell you the meaning of words on-the-fly, as well as it will show you the Roman text transliteration of Arabic speech. We have also added an audio recording and comparison program to give you a taste of confidence you may need before engaging in a conversation with a native, or before receiving a long distance call from your customer, or before you give a radio or TV interview. We know what it takes to achieve that caliber, and we suggest that you order eArabic Pro 6.0 today and start speaking Arabic in 10 days guaranteed. You can complete the entire course in four to six months of serious study, or you can use eArabic Pro 6.0 at university to graduate in Arabic like a pro.